Grangemouth Golf Club Message - "Please make an effort to repair your own and one other pitch mark on the green. This will benefit us all." Our Clubhouse is open to everyone - members, visitors and non golfers and can assure you of good quality food and a friendly service. 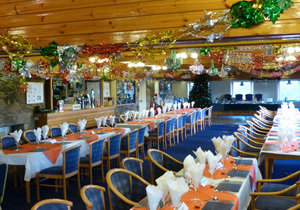 We have 2 lounges, The South Lounge, the largest, over looks the 18th green and can cater for up to 120 people seated. At the far end is a restaurant which can be segregated if required and can cater for 40 people seated. The North Lounge is slightly smaller and can accommodate 60 people with panoramic views of the River Forth and the Ochil Hills. We also can provide all day refreshments why not give our Bar Manager Helen a call on 01324 711500 for details. The Clubhouse opening hours are seasonal. Please call to check on 01324 711500 or email us at info@grangemouthgolfclub.co.uk. The course at Grangemouth was opened in 1974 making it one of the youngest in Scotland. Since then the course has played host to numerous PGA events, an indication of how highly it is rated among officials and, indeed, players. Grangemouth, which is always superbly maintained thereby remains in great year-round condition, is clearly a course which you have to think your way round. Grangemouth Golf Course, Polmont Hill, Polmont, Falkirk, FK2 0YA. Central Scotland.